Around the world we are seeing men step it up with initiatives that bring awareness to violence against women. Recently, in Bangalore, India, men took to wearing skirts to open up dialogue around sexual assault. In Toronto we have the White Ribbon Campaign and Walk a Mile in Her Shoes where Toronto men get out to walk a block in heels. 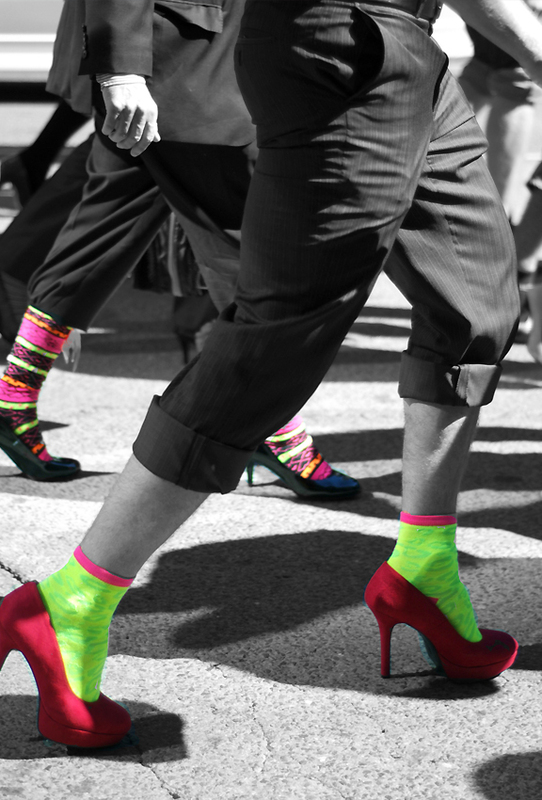 This year’s Walk a Mile in Her Shoes takes place on Thursday, September 26 from 12 – 2 pm starting at Dundas Square on Yonge Street. Thanks to all the fabulous men of Toronto who participated last year. WE LOVE YOU!!!! And thanks to all the fabulous men of Toronto participating this year as your efforts help create change and safe spaces for all people no matter their sexual orientation and gender identification. This entry was posted in Feminism, Gender / Sexuality, Photography Leah Snyder and tagged gender, Rights, Safety, Sexual Assault, Toronto, Walk a Mile in Her Shoes, Women by admin. Bookmark the permalink.